There was much rejoicing in the Hoelter household during the holidays. My oldest brother (H1) and his family (H1², H1.1, H1.2, and H1.3) were in town for multiple days. 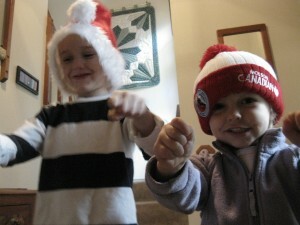 The little ones add life to the party and I am reminded of how much energy it takes to be a parent. 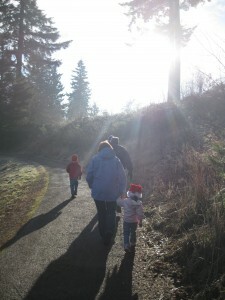 And headed to Hoyt Arboretum for a walk. I’ve never been up there, the morning frost provided an illusion of snow and there were nice views of Mount St. Helens. Upon our arrival back home, we opened a package sent to us from our Uncle Bruce and family. What was inside, provided a solid hour of fun and many lasting memories. The package contained a styrofoam cooler, which in turn contained multiple chunks dry ice. There was also some crab wellington in there, but it wasn’t quite as fun to play with. So, after the basic pouring of water on the dry ice to create smoke, H4 suggested trying to bottle up the pressure in some type of bottle. We learned a lot from one unsuccessful attempt, and using a basic plastic water bottle, found the right balance. The result was surprising, as you will notice in the following video. The projectile traveled over 50 ft through the air and landed in our neighbors yard. My 6 year old nephew considered it a science experiment and afterward wrote down what he had learned. The knowledge came in handy as I will explain later. With some mothers expressing safety concerns, we put a halt to the festivities and finished the day with the more gentle game of “Beatles Rock Band”. We opened gifts on Christmas Day with the whole gang present. My haul consisted of many travel related items that I requested and books. All high quality stuff that shall get extended use during the coming year. 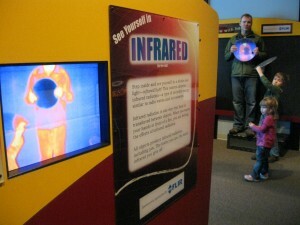 The family holiday concluded with a visit to OMSI where they just happened to have a dry ice exhibit. The presenters asked a question to the group of mostly adults and teens “Does anyone know what dry ice is made of?” My nephew, flush with the knowledge he had gained just 2 days earlier, replied “Of course, frozen Carbon Dioxide!” The adults looked at each other in shock while I began and embarrassed laughter as he also proudly stated that we had just made a bomb out of the stuff. No authorities were called, so we stayed a little longer to enjoy the ball room. A scrumptious Indian diner at a family friends house wrapped up the day. I have been slowly exploring my next travel plans and hope to make a decision/purchase within the next couple weeks. There are many factors to be weighed, mostly of the financial variety. Should I live like there is no tomorrow and ignore the fact that it will probably take me a while to find a job when needed? Or should I curb my enthusiasm for adventure and become a productive member of society? I shall try and break it down in my next post.